This is a life threatening and devastating complication of Diabetes which has tremendous social and economic impact. It may cause permanent disabilities and even death. Patients with brain stroke are often paralyzed (unable to walk normally), unable to speak, comprehend or have dementia (memory loss). 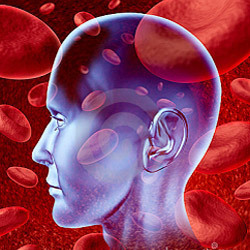 What are the Symptoms of TIA or Stroke ? What to do if someone has a Stroke ? Stroke is an 'Acute Emergency' thus the patient suffering from a stroke should be immediately rushed to a superspeciality hospital where all the facilities are available. There are some treatments (rtPA or alteplase) available for acute stroke (thrombo-embolic), but have to be administered in a short period of time (preferably < 3 hours) after the onset of stroke to give maximum benefit. High Blood glucose levels during or after stroke may cause another acute complication of Diabetes-Hyperosmolar Hyperglycemic Syndrome, which may further complicate the management of stroke. In case of brain haemorrhage ('Haemmorhagic Stroke'), the treatment is to control high blood pressure and any other cause if present. Sometimes even brain surgery may be required. Diabetics are twice as likely as other people to have heart disease or a stroke. Controlling the ABC of Diabetes i.e. A1c (blood glucose), Blood pressure, and Cholesterol, can cut your risk of heart disease and stroke. Eating Healthy foods, being physically active, losing weight, quitting smoking, and taking medications (if needed) can all help lower your risk of heart disease and stroke. If you have any warning signs of a stroke, don’t delay and get medical care immediately. 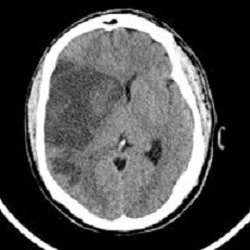 Early treatment of a stroke in an emergency room (ER) can reduce damage to the brain. ACT immediately to SAVE Your BRAIN !